"The Dievas AquaLuna Professional is a Swiss Made, 1000metres water-resistant dive watch powered by the robust and reliable Swiss automatic 28,000bhp mechanical automatic movement, ETA-2824-2. The watch measures a diameter of 44mm(excluding the crown) and 18mm thick, utilizes a 3-piece case which is entirely milled from the best grade 316L stainless steel using the latest CNC technology. After CNC, the raw case is checked for blemishes. And the case is further processed with a stealth PVD finishing which gives it a non reflective surface. A 120-click, tight, positive click action uni-directional bezel tops off the main case, complete with ‘diamond-studded’ notches all round. Diver’s time elapse markings are meticulously engraved on the surface of the bezel coupled with a luminous pip at 60 minute for below depth timing duties. Upon close inspection, one will notice the polished tip of the diamond studs that glitters as it catches light giving the watch that tad of sparkle, a rather unique classy complexion altogether. A premium grade 5.5mm thick sapphire crystal with military grade super anti-reflective coating seals the inside surface..."
"The origins of Dievas Watches can be traced back to the year 2006. 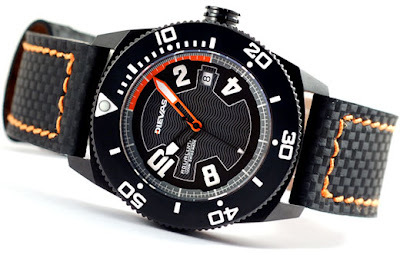 Dievas Watches manufactures their watches in Switzerland. Produced in limited quantities, Dievas Watches are designed to cater to the insatiable demand of watch connoisseurs and collectors. Dievas Watches’ on-going commitment to manufacturing high quality watches with our one to one interaction with every customer so as to give them 100% satisfaction is the our core competency. Our personal relationship with our customers goes to show how much we treasure customers’ feedbacks. Dievas Watches are all hand assembled in clean rooms to ensure that customers receive nothing but the best. Using the best of materials like Swiss mechanical movement, sapphire glass, 316L surgical stainless steel and ceramic bezel in their watches, Dievas aims to provide customers with quality watches at affordable prices. On top of that Dievas watches also innovate by using Swiss Made Tritium tubes as luminous and Plasma Assisted Chemical Vapour Deposition - Diamond Like Carbon on our cases. Our continuous research and development in watch manufacturing will only mean more industry first for Dievas Watches. Available in over 10 countries, Dievas Watches is very well received by both collectors and military alike. Dievas Watches will continue to offer exciting pieces and fresh designs in time to come."